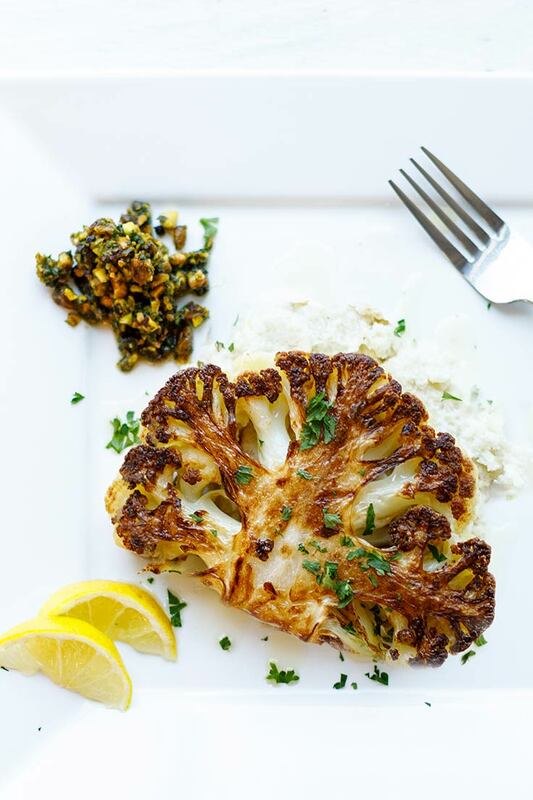 Cauliflower is a versatile vegetable with a wide range of possibilities: it can be riced and made into balls for frying or baking, or it can also be mashed like potatoes. 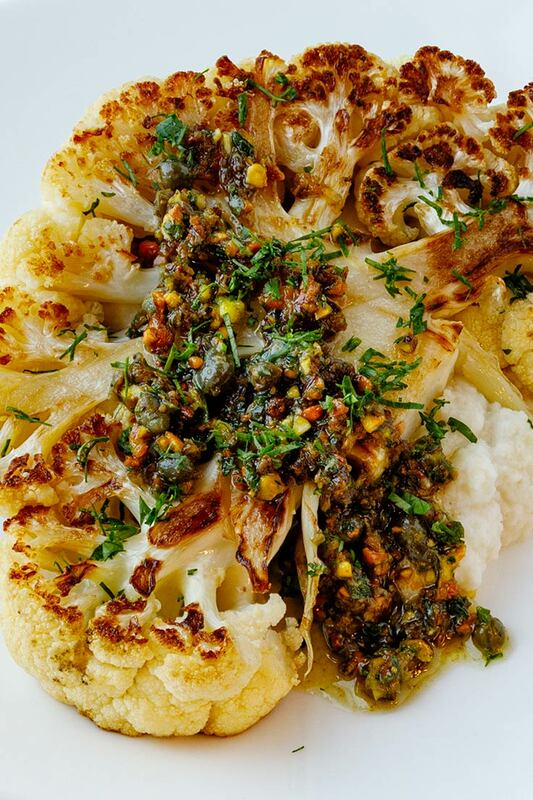 Here, we cut cauliflower into “steaks” and lay them on a bed of cauliflower purée. 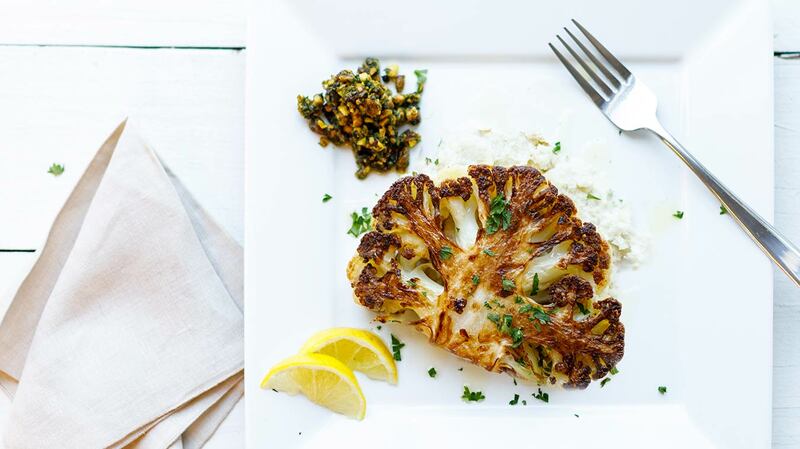 If you are avoiding carbohydrates, cauliflower is a great alternative to starchier vegetables, rice, or pasta! Serves 2-3 depending on cauliflower size. 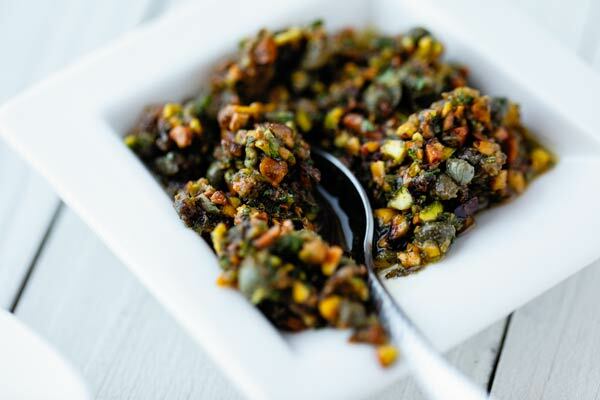 On medium high heat, sauté the capers in olive oil with oregano until the capers have burst and are crispy, 3-4 minutes. Transfer to a heat proof bowl and add all remaining ingredients. Set aside to let flavors meld while you prepare steaks. Cut two ¾” slices from the middle of the head of cauliflower. Depending on the size of your cauliflower, you may be able to get three steak slices. Gently separate the remaining florets from the outer edges of the head of cauliflower. Bring a medium pot of salted water to a boil and cook florets until softened, about 5 minutes. Drain the florets and place in a food processor. Add garlic, a pinch of salt, and tahini. Purée until smooth, add 1 tbsp water if you like your purée thinner. Set aside. In an oven-proof sauté pan or cast iron skillet, heat the olive oil, butter, and lemon zest. 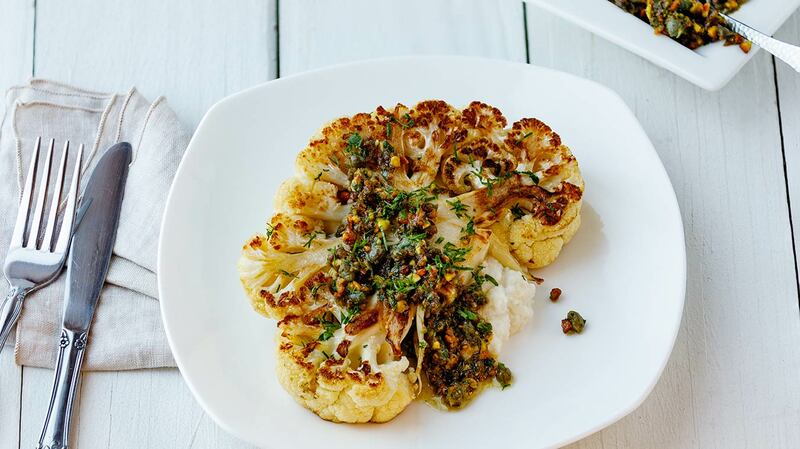 Immediately add the cauliflower steaks and sauté on medium heat for 3-4 minutes on each side. Be gentle when turning the steaks, so that they stay in one piece. Once they have browned, place the pan in the oven and bake for 15 minutes until steaks are tender. 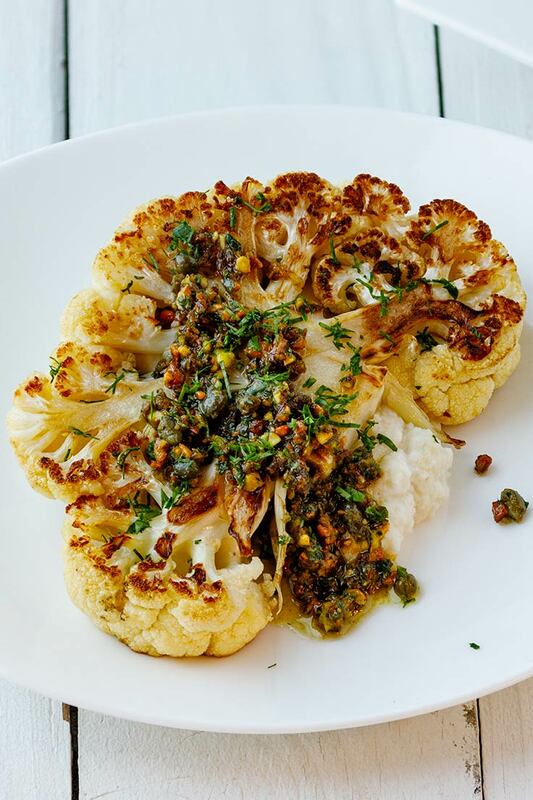 Place two tablespoons of the cauliflower purée on each plate, top with a cauliflower steak, and add a spoonful of caper salsa on the side. Finish with a drizzle of Organic Extra Virgin Finishing Olive Oil infused with Kalamata Olives. Leftover cauliflower purée would be delicious simply sprinkled with parmesan and fresh herbs to replace mashed potatoes.